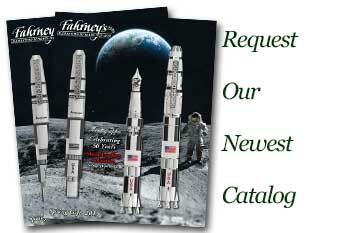 Order your American Heritage Boston Symphony Hall Stage Floor Fountain Pen today from FahrneysPens.com. Fine Pens, Refills & Luxurious Gifts – great prices & fast shipping. 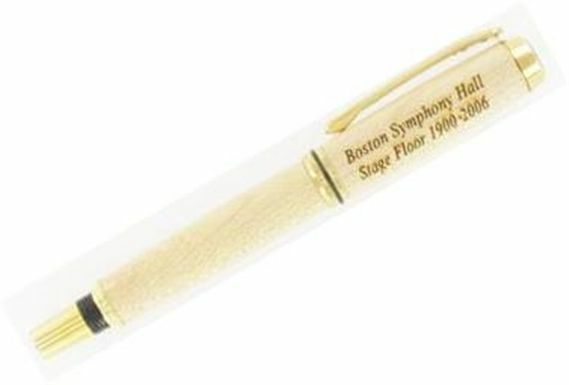 The Boston Symphony Orchestra is proud to offer this limited edition, hand-turned and polished medium nib fountain pen crafted from the original floorboards of Symphony Hall's historic stage. During the summer of 2006 the Symphony Hall stage floor was replaced for the first time in the hall's 105 year history. The original floor had become uneven, squeaky and close to buckling in some places - a result of more than a century's worth of wear and tear. In an effort to maintain Symphony Hall's existing acoustics, the stage floor was disassembled and replaced using techniques and materials employed when the Hall was originally constructed in 1900. The original stage floor was hard maple, tongue-in-groove, three quarters of an inch thick; the new floor is also hard maple of the same shape and thickness. The new flooring arrived at the Hall early in the summer in order to acclimate it to the building's temperature and humidity, which were monitored carefully throughout the project. Nobody knows exactly how many layers of varnish and polyurethane were applied to the original floor to give its deep caramel color. Because the new floor was not stained, it is much lighter in color. No changes were made to the angled rough planks of the sub-floor or to the supporting structural system. the layer of felt between the floor and the sub-floor, installed to minimize sqeaking, was carefully replicated as well. Hand-cut nails of the same type and size used in the original construction were employed in the same patter and were hand-pounded as they would have been more than a century ago. A worthy present for my daughter, a professional bassoonist.